Safety is an important consideration when operating a hot tub, but did you know some hot tubs include more safety features than others? Sure, there are some safety features that are required by law. The Virginia Graham Baker law affects the suctions that are to make to spec to avoid any hair entrapment. This means having at least 2 suctions for each pump so that if one plugs up, there is not a potentially dangerous hair entrapment issue. Other safety features such as walk-in safety steps are optional and up to the individual manufacturer. At Hot Tub Outpost, we offer QCA Spas at discount prices online with free shipping and no tax (except in the great state of Texas). These spas have numerous additional safety features including automatic freeze protection and automatic overheat protection, barrier-free seating, walk-in steps on many models and lockable safety covers. Check out the larger 3-step steps with hand rails for additional security when getting into and out of the spa. All of these spas are ETL and CE approved/rated and also exceed the California Energy Commission standards for hot tub energy usage. Using proper, brand name components such as Balboa, Waterway, Aquaflo and Lasco assures a safer hot tub construction. Safer components = Safer spa. When it comes to water chemistry, having a built-in chemical feeder also helps provide proper sanitization. A built-in ozonator can further improve water quality. Peace of mind when operating the spa and when bathing in it is what you get when you purchase a spa from a manufacturer that values safety such as QCA Spas. 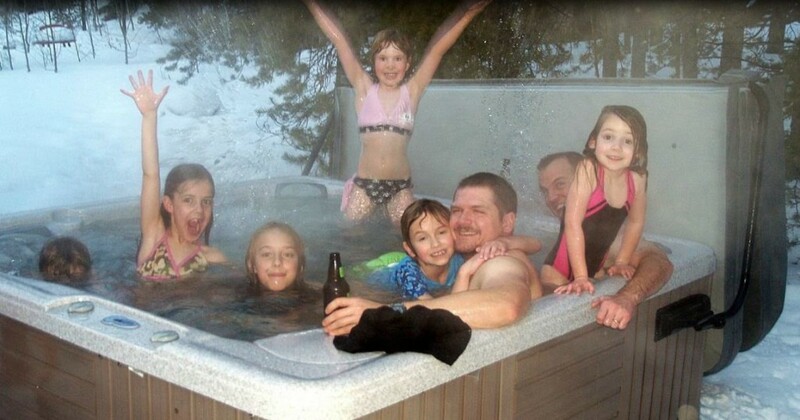 There are other spa manufacturers that also value safety and go above and beyond, so if you need any hot tub parts or accessories or to repair or replace any hot tub safety feature, you can get your parts and supplies online at www.HotTubOutpost.com. The luxurious GT500 features an Ultra Wave Lounger with separate wave massage control. The wave sequencer allows for different rows of jets to sequentially massage the entire body. For pure luxury, try the wave lounger found on the GT500 or Paradise Ultra models by QCA Spas. The difference between the Wave Max seat found in spas like St. Maarten XL or Paradise XL and the Ultra Wave Lounger is that the moving massage is applied to the entire body in the lounger vs. the upper body only at a Wave Max Seat. 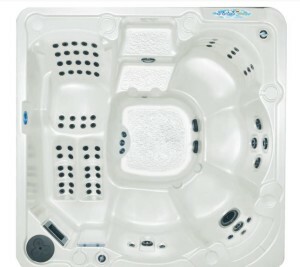 Some spas have both of these features such as the Paradise Ultra. The patented wave lounger comes with its own 4 button controller that allows for the pausing, changing or program or direction of the moving massage. Different rows or different speeds are possible, or even freeze the massage on your lower back for a more spot intensive massage. Go row by row, up and down and enjoy. There are 6 different sequences at 3 different speeds as well as a pause button. The controller has an LED light to show what system or sequence you are on. Set your speed and enjoy the affordable GT500 with lots of power and 2 jet pumps. These types of spas come with a lot of jets and a lot of contact points to the body for maximum massage. Contrast that to a standard hotel Jacuzzi that may have only a few jets and you will have a true resort spa in your own backyard oasis featuring the GT500 hot tub spa. 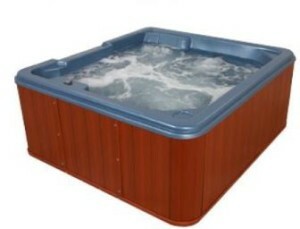 Get the best deal on a wave lounger outfitted hot tub from Hot Tub Outpost at www.HotTubOutpost.com. Insulation is an important energy saving feature of a hot tub. The spas made in Iowa by QCA Spas all exceed the stringent requirements of the California Energy Commission and employ a multi-layer approach to insulating a hot tub. First of all, since heat rises, having a quality hot tub cover is the single most important component to saving energy and electricity. Covers without steam stoppers and other energy saving features may let heat escape more rapidly from the spa than would be the case with a well-made spa cover. QCA uses excellent quality covers that include these features to not negate the rest of the energy savings construction methods. The spa cabinet has insulation all the way around. The Styrofoam with an added reflective foil barrier adds an extra level of insulation. The spa is foamed and the cabinet is insulated. 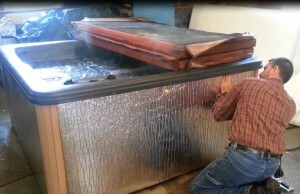 The heat recovery system is the dead air space that traps hot air. This not only creates that window pane type air insulation barrier, but allows the hot air to be reused to heat the water. Fully foamed spas are an old style method of building hot tubs because the foam provided support to thin spa shell material. These types of spas are extremely costly to repair should a leak occur as finding leaks in fully foamed cabinets involves digging out a lot of foam and then trying to find the component that has a leak. By the time a leak is even apparent in these types of hot tubs, a foul odor can already be permeating the cabinet and mold, mildew and bacteria may be present. Avoid the hassle and potentially high repair bills by buying a hot tub like the QCA Spas line that uses thermal air barrier type insulation as one of the insulating factors. The Polar Insulation System traps the heat inside the cabinet without needing exhaust vents that would let all the warm air escape. A well-insulated spa + a great spa cover = energy savings for your hot tub. QCA Spas is one of the oldest hot tub manufacturers on the planet in business since 1966. Reliable, trustworthy and experienced, the folks at Hot Tub Outpost have also been serving the hot tub industry for over 30 years. 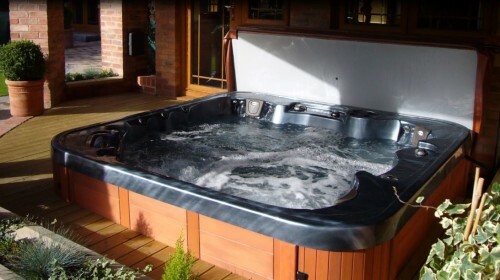 Get any quality QCA Spas hot tub model online from www.HotTubOutpost.com. Installing a cover lifter on a hot tub can make removing the hot tub cover simple. Many times a second person is not around when the hot tub is being used, so one person is left with the task of removing the heavy and awkward cover. When only one person removes the cover, especially from larger hot tubs, it tends to come crashing down on the floor or grass, or rub up against the building or other obstructions. These dings and dents can soon cause a tear in the thin inner lining and produce a waterlogged hot tub cover. Once the cover starts getting water in the center core, it gets even heavier and heavier, making it even more difficult for one person to remove and replace the cover. Now the cover has become so heavy, that a back injury is possible when trying to hoist it back up onto the spa. The solution to avoiding all this is a cover lifter. Having a cover lifter means that one person with one hand can raise and lower the cover with no problem. The cover is then automatically stowed to one side of the spa. There are different styles of cover lifters. Some of the most popular types have a crossbar going across the middle fold of the hot tub cover. The cover lift bar on the side of the spa allows the person to first fold the cover in half and then continue pushing the bar until the cover is safely stowed to the side of the spa. Some lifters have the cover all the way down to the side while others keep the cover up higher. The two main ways to mount the spa cover lifter to the spa cabinet is either with an under cabinet mount or the more standard cabinet mount, where the brackets attached directly to the hot tub frame/skirt. Cover lifters save the cover from getting mishandled and becoming damaged, help one person enjoy the spa without risking injury and keep the cover nearby for easy opening and closing. One more benefit is that the lifter keeps the cover elevated slightly so that grass and dirt does not get dragged back into the clean spa water by the cover. Extend the replacement time on your hot tub cover by using a cover lifer and enjoy the utility! No more thinking, should I go in the hot tub now and go through all that cover removal hassle? Just lift with one hand and climb in! Should I operate my spa at 110 volts or 220 volts? There are spas made specifically for 110v operation. These plug and play type spas usually ship with their own GFCI protected power cord, so they just plug into a standard power outlet without needing the services of an electrician most of the time. Many online sources mistakenly say there are 110 volt hot tubs that are different from 120 volt hot tubs. This is not the case with some of the 110/220 convertible hot tubs which you can operate at either 110v or 220v. Here are some highlights of the differences between operating a spa at 110 volts and at 220 volts in North America. To install a 220-230 volt hot tub usually requires the services of a licensed electrician to install the circuit breakers, proper gauge wiring from the main electrical panel to the junction box. In addition an outdoor GFCI panel with manual shutoff/disconnect is required in most communities so that also needs to be bought and connected along with running wire and conduit to the actual hot tub and hooking it up. Wiring the GFCI can be a little tricky for electricians that are not familiar with hot tubs since most 230 volt hot tub installations require a 4 wire installation instead of just 3. A wiring diagram can be found in the hot tub owner’s manual and also as a download from Hot Tub Outpost. The cost of the electrician, wiring, breaker, GFCI, and supplies can cost many hundreds of dollars to even a thousand dollars or more, so eliminating that cost with a 110v spa makes the procurement cost lower. Although a hot tub is not typically moved around, the 110v version allows it to be easily relocated to another area and another exterior wall plug. With a 230v hot tub, the installation and wiring is fixed and cannot be moved to a different location without calling the electrician back out for some major rewiring. This is the main payoff for having a 230v hot tub is that the heater can operate while the jet pump(s) are running and the heater can also be more powerful. 110v spas are usually limited to a 1kw heater and are also set to turn off if the pump is turned on high speed, thus keeping the current under the maximum that you can operate on a standard 15A or 20A household power outlet. A 230 volt hot tub will be able to operate with a 3kw, 4kw or even 5kw electrical flow through heater, so the water heats faster and heats even during use. Whether the spa operates at 110v or 220v, some things remain the same. The construction of the spa is typically made of the same materials, the power of the jets is also about the same because although plug and play models may have a less powerful pump (1 1/2hp instead of 3,4 or 5hp), there are also less jets on the line, so the flow rate is kept similar to the flow rate coming out of the larger spas, only the larger ones would have more jets on a single pump. The manufacturer usually adjusts the number of jets per pump to achieve a consistent flow rate. Both 110v and 220v hot tubs will maintain temperature up to 104 degrees F if the spa is properly covered. The 110v hot tub may heat more often, but use less power when doing so. You may have fewer jets since the pump is less powerful, but the actual massage/flow rate is more dependent on gallons per minute of water flowing from the jet rather than the actual pump size and operating voltage. The spa may be somewhat smaller so there is less water to heat, so that the 1kw heater found in the 110v spa can keep up with the heating task. Typically, the 110 volt hot tub will cost less, have less jets, be a mid-size unit, not require an electrician for installation and is portable. The 220 volt hot tub will have a more powerful heater and typically more jets and a larger amount of water/room. The convertible 110 volt units found at Hot Tub Outpost allow you to use them as 110v plug and play hot tubs, but decide later if you want an electrician to come out and setup the external wiring, GFCI and breaker. Then it will take the electrician less than a minute to convert the spa pack from 110v to 220v which automatically turns the same built-in heater from a 1kw to a 4kw heater and allows the pump to operate on high speed even when the spa is heating. See our other article on how to convert a convertible 110v spa to a 220v spa. Hot tub steps are not only an important safety feature of spas, but also make it easier to get into and out of the hot tub. Especially taller hot tubs are hard to climb into without a set of steps. Even the shallow ones need the steps though, since it is safer and easier to get into the spa that way. For in-deck installations, it is recommended to raise the edge of the spa by 13″. That way a set of steps with 2 tiers can fit evenly with the hot tub as well. Another reason you would want to not make an in-deck installation of a hot tub exactly even with the floor is that debris tends to get into the hot tub easier that way, the cover is harder to tie down and it is a pain to stoop down all the way to the ground to check chemicals. Hot tubs are supposed to be relaxing, so maintaining one and entering/exiting one should not be a chore. There are wooden steps and new plastic steps with safety treads. The wooden steps are outdated since they not only may splinter but require periodic maintenance and restraining to keep up their appearance. The new plastic steps come in a variety of colors to match the type of color on your spa skirt, and by the way that skirt is now probably made of plastic/PVC materials as well. Although wood used to be the norm when it came to hot tub cabinets and steps, in the last decade the plastics have become much more popular for that very reason. They require no maintenance, and maintenance is what a hot tub owner wants to minimize. 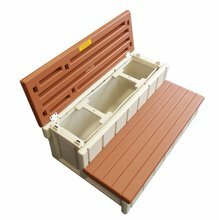 Of the plastic steps available, there are 2 tier steps (around 13-15″ tall depending on the step) and there are 3 tier steps for tall spas. Note that if you purchase a 3 tier step, most counties require a safety rail, whereas a railing on a 2 tier step is not usually used or optional. You can purchase a separate handrail that mounts to the cabinet with or without our steps as well. 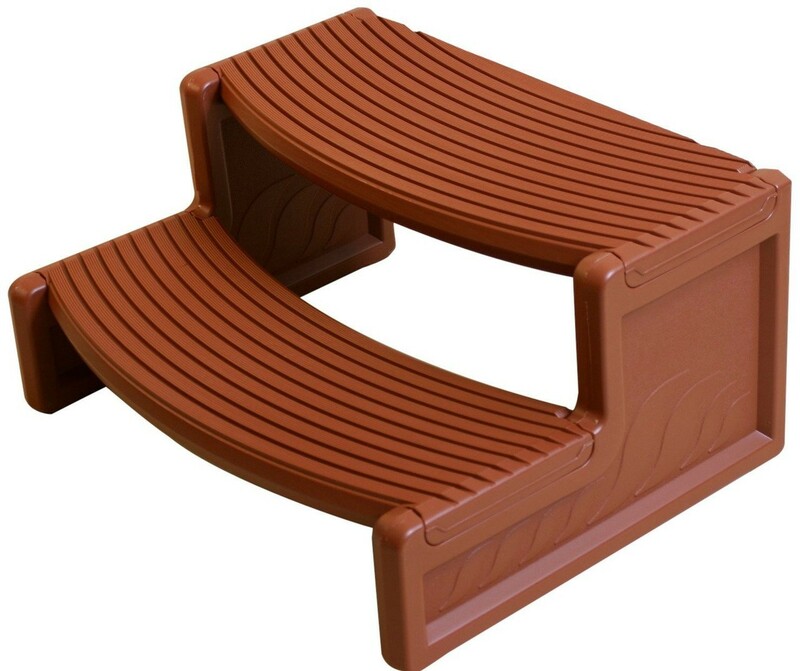 The hot tub steps are made of durable, fade-resistant plastic and also have grooved treads for slip resistance. The HS2 Handi-Step is an example of an affordable step that is durable and versatile. The HS2 allows you to turn around the treads to fit up against either a straight-sided spa or a round hot tub. These come in a variety of colors. There are also storage steps with hinged lids where items can be stored under the upper step tier to access the step’s interior. Some of the steps in the Leisure Accent line are 36″ wide and ship fully assembled. They are 14″ high and have 2 treads. The storage compartment can be removed for easy cleaning in this type of step. They also come in an extra wide configuration of 74″ wide. These steps can support up to 300 lbs. If you’re over that, then you may have an issue with water overflowing out of the tub as well. The Signature Spa Steps with 3 treads include the hand railing and it is 24″ high to the top step. These dual handrails are ideal for the ultimate in safety for getting into and out of tall spas. Of course this 3 tier step also has a drink holder and towel bar as part of the railing feature. Now if you really want to get fancy, there is also a 4 tread step with 2 rails. Just message the folks over at info@hottuboutpost.com for your custom made step. Get all your hot tub steps and accessories at America’s Hot Tub Outpost. 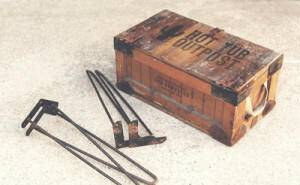 Visit www.HotTubOutpost.com now for more info. Hot tubs are a wonderful accessory to have in a home. They offer a convenient means of relaxation, offer therapeutic hydrotherapy, and are a great focal point for any backyard party. But they also require a great deal of regular care and maintenance in order to function at their highest capacity. In addition, ensuring that the cleanliness and sanitation of the water is maintained is also very important for both your safety and the spa equipment. Buying a hot tub and all its accessories is a big investment, which is why it’s in your best interests to care for it properly. When it comes time to purchase hot tub parts in Canada, a great way to save money time is to buy these components online. Affordability – Purchasing all your replacement spa parts online can save you big when it comes to cost. The main reason is because consumers are purchasing directly from the supplier, rather than have to go through a middleman who will have to increase the cost in order or the retailer who needs to make a profit. Instead, buying direct can help you save. There are also many quality replacement parts designed to fit the top models of spas – without the additional cost added on for the label when you buy it from your spa retailer. Convenience – How convenient and easy is it to be able to shop from the comfort of your home, without having to fight the crowds at a retail store! Shopping online affords you with this convenience, where you can browse through hundreds of products to help you find exactly what you are looking for when it comes to replacement spa parts. Not sure what you need or exact size? Call our toll free hot line to get the right part for your spa make and model. Range of Choices – The choices are seemingly endless when you shop for spa parts online at the Hot Tub Superstore. Whereas at typical retail stores the inventory is somewhat limited, the choices you have on our website are much more vast since we keep a huge warehouse of inventory on hand. We can help you get exactly what you’re looking for and if we don’t stock it – we can find it! Clear Descriptions – Online shops for spa replacement parts often come with detailed descriptions of the products, as well as dimensions or how to measure tips. Even if you don’t find this information online, you can call our friendly advisors and they will help you find the spa parts and accessories you need. Whatever spa part you’re looking for, you’ll be sure to find it online with low prices and great selection. Shipping is free in Canada over the Free shipping threshold for most online retailers.